Sift together the dry ingredients; the flour, baking powder, salt, and sugar. 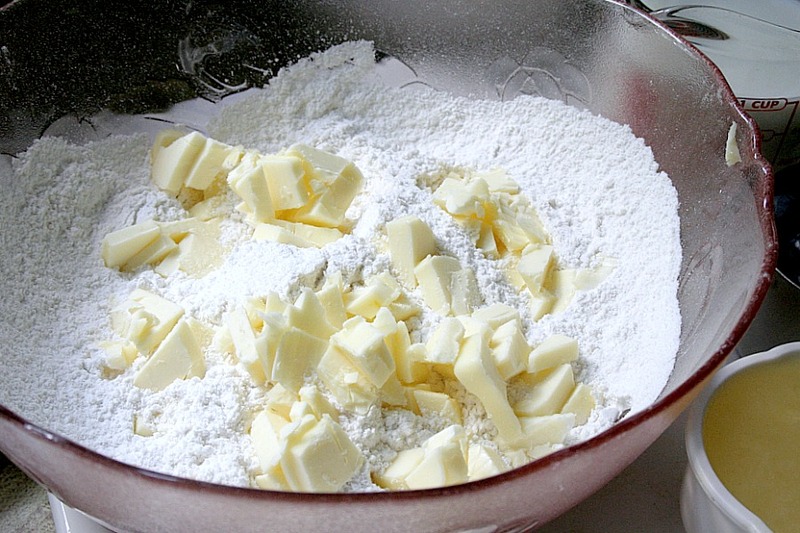 Using 2 forks or a pastry blender, cut in the butter to coat the pieces with the flour. The mixture should look like coarse crumbs. Make a well in the center and pour in the heavy cream. Fold everything together just to incorporate; do not overwork the dough. Fold the blueberries into the batter. Take care not to mash or bruise the blueberries because their strong color will bleed into the dough. Press the dough out on a silicone mat or lightly floured surface into a rectangle about 12 by 3 by 1 1/4 inches. Cut the rectangle in 1/2 then cut the pieces in 1/2 again, giving you 4 (3-inch) squares. Cut the squares in 1/2 on a diagonal to give you the classic triangle shape. Place the scones on an ungreased cookie sheet and brush the tops with a little heavy cream. Bake for 15 to 20 minutes until beautiful and brown. Let the scones cool a bit before you apply the glaze. 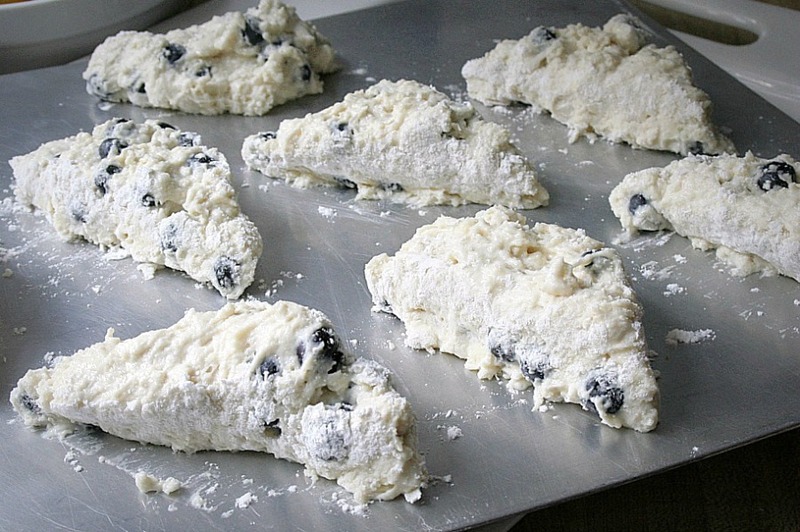 This recipe for blueberry scones is a little messy but easy to make. Be sure to handle the dough lightly and you will have a very tender scone. With just 2 Tablespoons of sugar in the dough, most of the sweetness comes from the glaze that is applied after cooling slightly. Our local blueberries are currently being harvested. I bagged and froze lots to be sure we will be enjoying them all through the winter. Sift together the dry ingredients; the flour, baking powder, salt, and sugar. 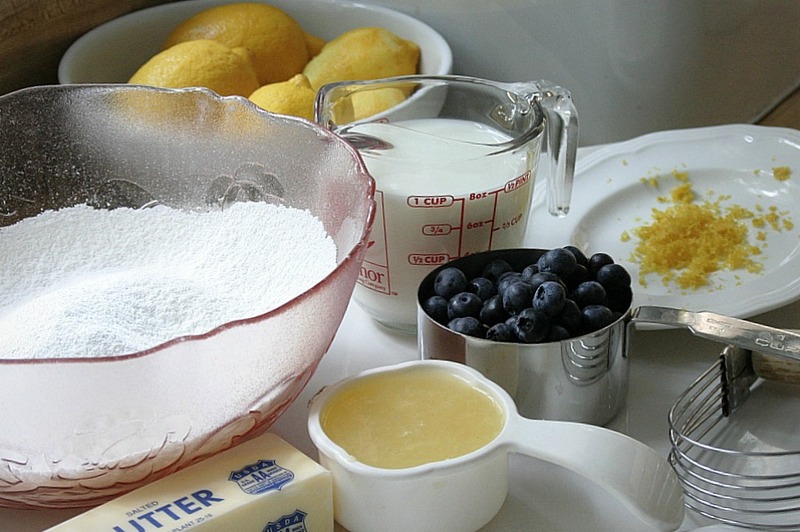 Using 2 forks or a pastry blender, cut in the butter to coat the pieces with the flour. The mixture should look like coarse crumbs. Make a well in the center and pour in the heavy cream. Fold everything together just to incorporate; do not overwork the dough. 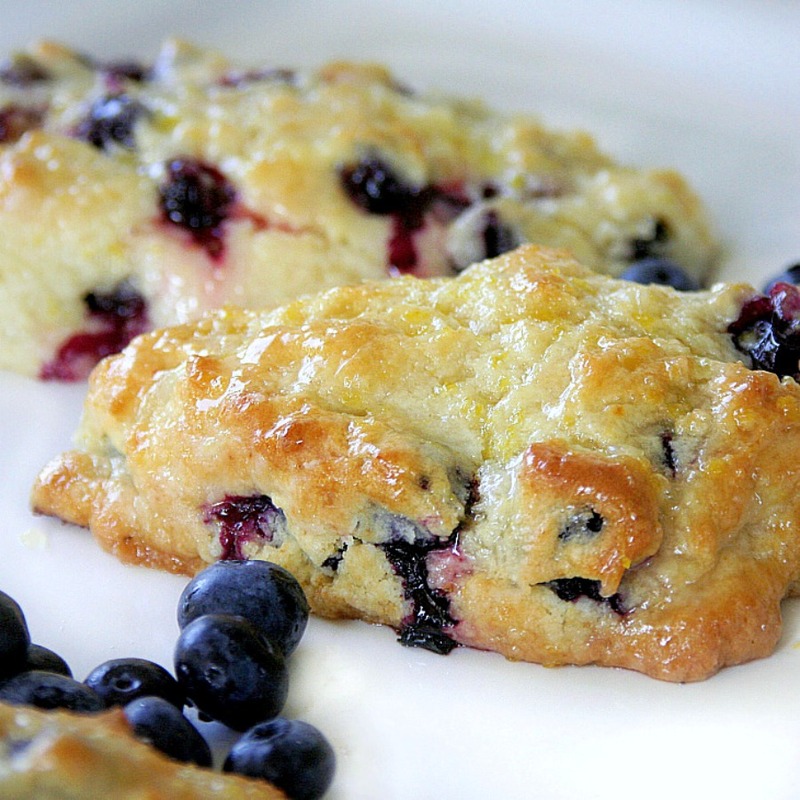 Fold the blueberries into the batter. 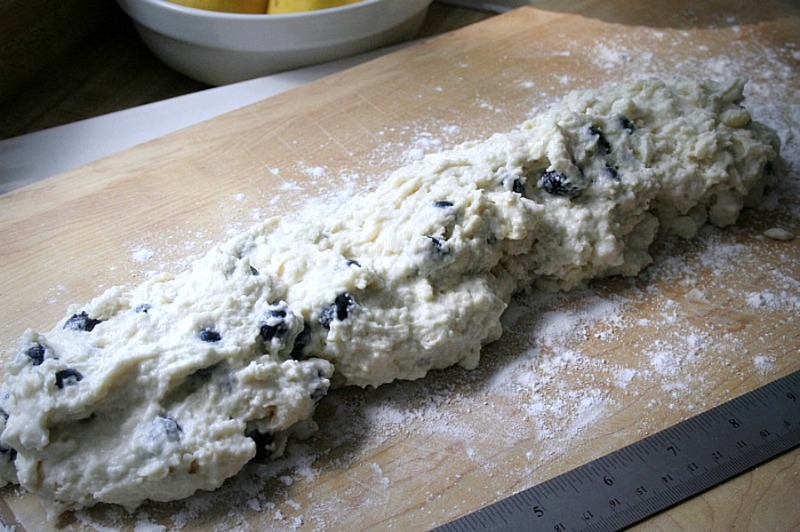 Take care not to mash or bruise the blueberries because their strong color will bleed into the dough. Press the dough out on a silicone mat or lightly floured surface into a rectangle about 12 by 3 by 1 1/4 inches. Cut the rectangle in 1/2 then cut the pieces in 1/2 again, giving you 4 (3-inch) squares. Cut the squares in 1/2 on a diagonal to give you the classic triangle shape. 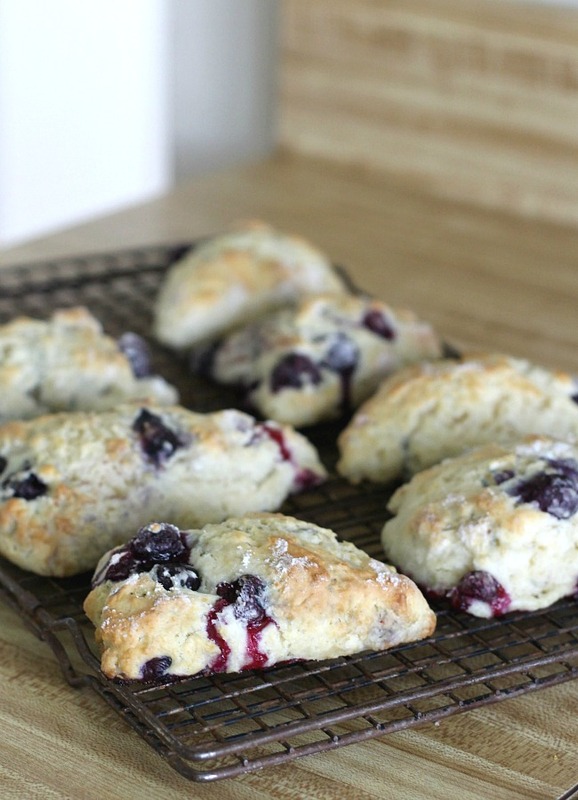 Place the scones on an ungreased cookie sheet and brush the tops with a little heavy cream. Bake for 15 to 20 minutes until beautiful and brown. Let the scones cool a bit before you apply the glaze. Technically you should make this simple lemon glaze in a double boiler (i.e. over a pot of simmering water with a heatproof bowl set on top) but it’s even simpler to zap it in the microwave. Mix the lemon juice and confectioners’ sugar together in a microwave-safe bowl. Stir until the sugar dissolves. Add the lemon zest and butter. Microwave for 30 seconds on high. 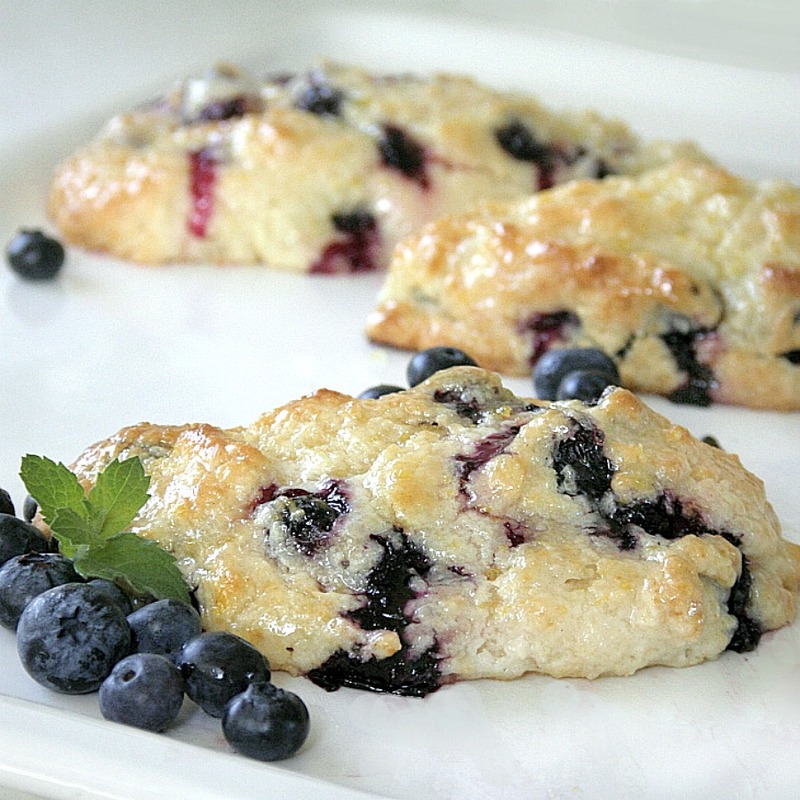 Whisk the glaze to smooth out any lumps, then drizzle the glaze over the top of the scones. Let it set a minute before serving. I don’t have heavy cream.. but I do have plain full fat yogurt.. can I use that as a substitute if I thin it out with some 1/2&1/2.? This is such an interesting idea. I often try substitutions using what I have and willing to take a chance. Most times it works. I wonder if you can get the yogurt to the right consistency as the heavy cream that this would work. Or maybe just use all half and half. Please let me know what you do and the results! Thank you! I was digging for a special breakfast treat for upcoming visitors. I'm so glad I found this post. dang those look so yummy!!!! That glaze gives those scones such a gorgeous shine. Your pictures are just beautiful! Oh these do sound lovely!! Perfect with a nice cup of tea! Yum and how pretty! I have some blueberries in my fridge right now. 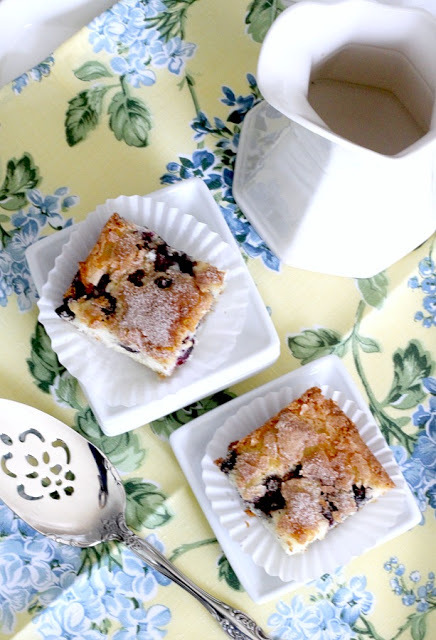 Maybe I'll make these tomorrow…. I invite you to link these up at my Vegetarian Foodie Fridays if you like. I'd love to have you! Your photos are FABULOUS! 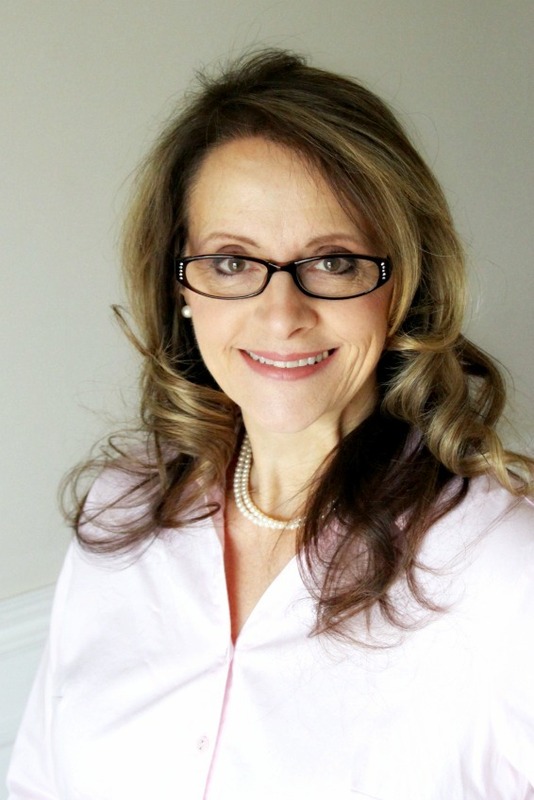 I'm bookmarking your blog as I'll definitely be back! 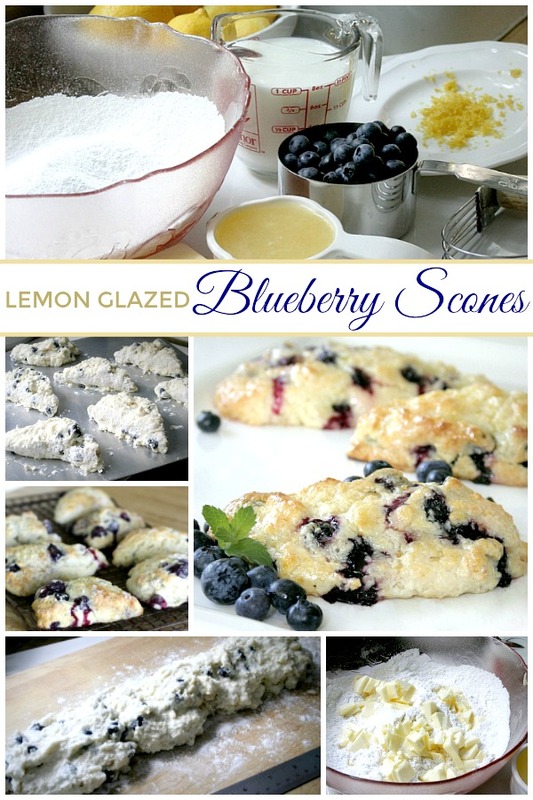 I love scones and these look delightful. That looks delicious! We have a good supply of blueberries in the frig, but the birds ate every single one on my blueberry bush! They got under the net! 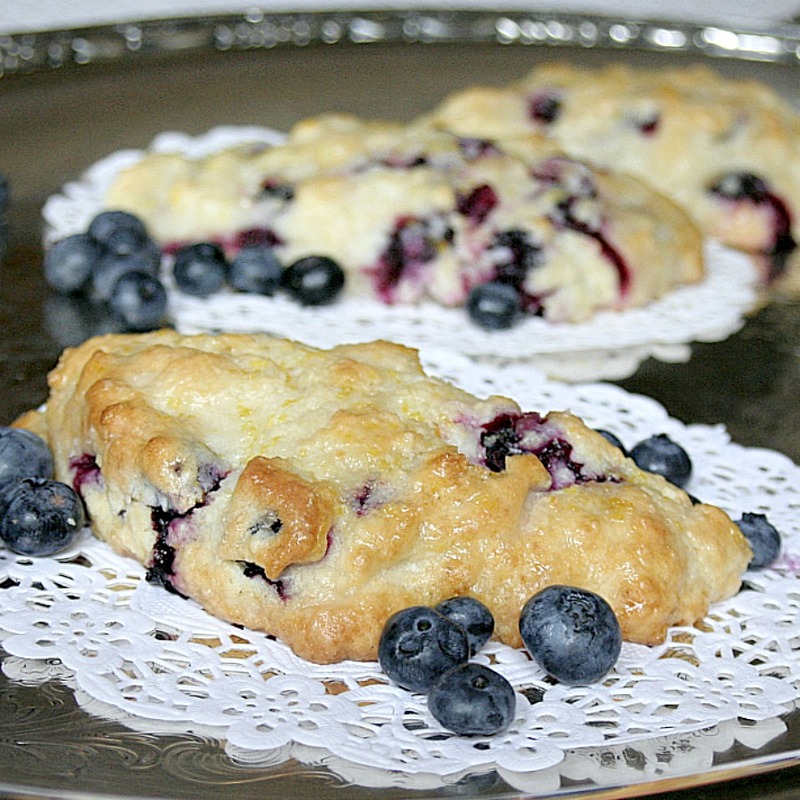 I love scones, such a great breakfast treat, beautiful photos! That first pic is a jaw-dropper. Looks just amazing! Oh my, they make my mouth water. Do you do anything to the blueberries before freezing? Do you wash? These look so delicious! I love blueberries! Your pictures are so wonderful, it looks like I could just take a big yummy bite right out of one of those. Those look so delicious Lorraine. Karen has had fresh blueberries this week and has become the Smoothie Queen! One of those giant lemons from Florida would be great to have on hand for this recipe!